The Consumer Price Index (CPI) rose 0.4% in January, after a similar increase in the prior month. The difference between December and January price data is that food (+0.5%) and energy (+2.1%) and the core CPI (+0.2%), which excludes food and energy, rose in January, while higher energy prices (+4.0%) played the major role in December. 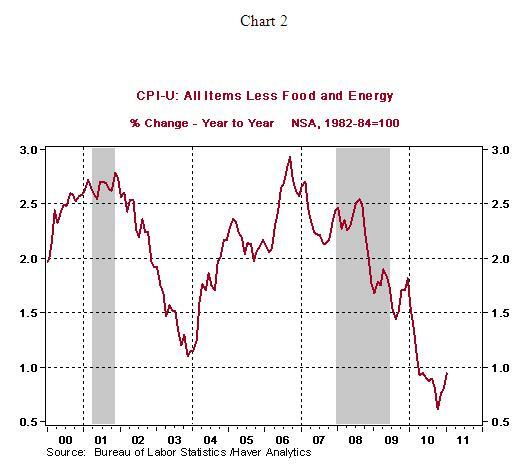 The CPI has moved up 1.63% from a year ago, which is a 48 bps increase since June 2010 (+1.05%), the recent low for the CPI (see Chart 1). Higher food and energy prices accounted for two thirds of the increase in the overall CPI in January. The core CPI, which excludes food and energy, increased 0.2% in January, after a string of smaller increases each month since October 2009. 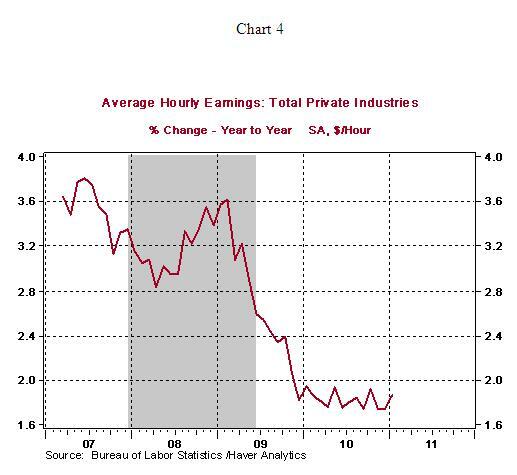 On a year-to-year basis, the core CPI has risen 0.95% in January, the largest gain since March 2010. 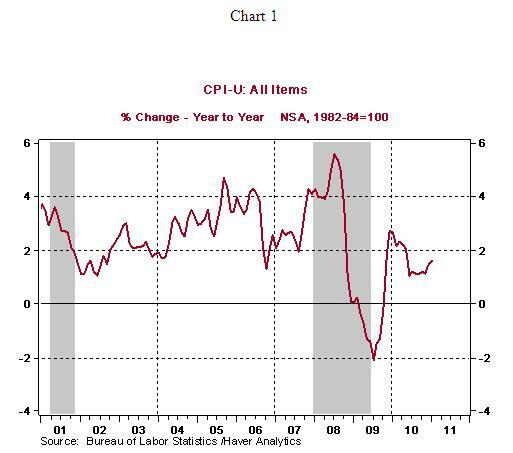 Markets will be tracking the trend of the core CPI closely given the fact that the core CPI is moving up gradually from a low of 0.61% in October 2010 (see Chart 2). It is noteworthy that among the core items, prices of apparel (+1.1%), shelter (+0.1%), airline fares (+2.2%) and recreation (+0.2%) advanced in January. Offsetting these gains, were lower price gains for medical care (+0.1%) and lower prices for new and used cars. Conclusion - The Fed is in a sweet spot, temporarily, to focus on economic growth and complete the current purchase plan of $600 billion in Treasury securities. 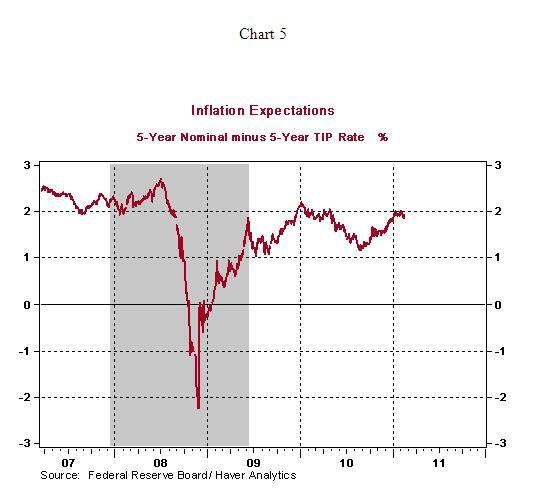 Other potential sources of inflationary measures such as unit labor costs and hourly earnings are contained (see Charts 3 and 4) and inflation expectations are also suggesting a favorable outlook for inflation (see Chart 5) in the near term. 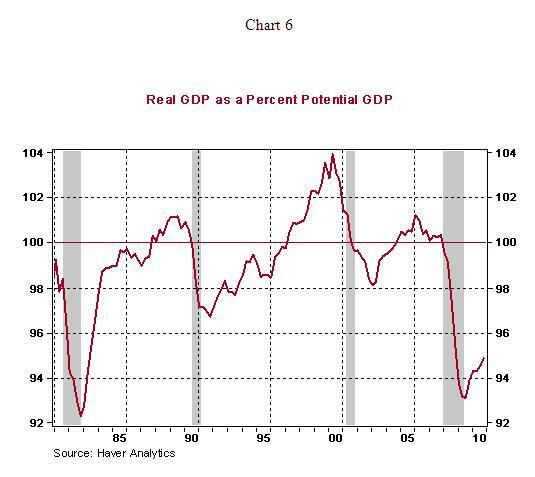 In addition, there is enormous slack in the economy, as measured by the elevated jobless rate (9.0% in January 2011) and real GDP of the economy is significantly below its potential (see chart 6). Additional hikes in food and energy prices are entirely conceivable as the rest of the world economy grows in 2011, particularly the less developed economies. The pass-through of these higher food and energy prices and prices of imported goods in the United States is small, for now. 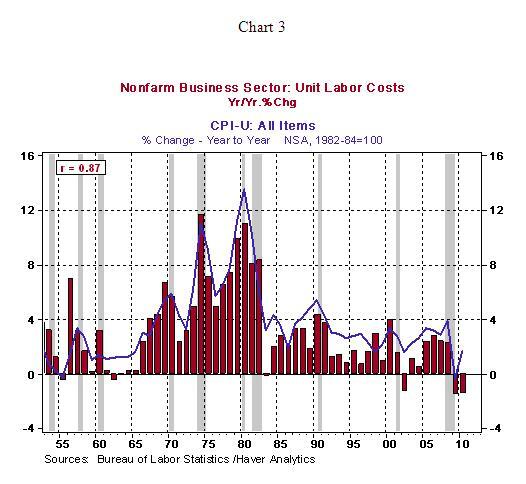 In the growth-inflation debate, the Fed's focus will shift to inflation as the pace of economic activity shifts to a higher gear and the unemployment rate posts further declines towards the final three months of 2011.